This is what a good 30+ year-old long jumper looks like. "So do I measure from the end of the board or do I try to guess where they took off from?" I hadn't been to a track meet since the last millennium, but back then, they knew how to measure long jump. This case was different in many ways, though. First off, the age range wasn't 15 - 19 it was 5 - 90. 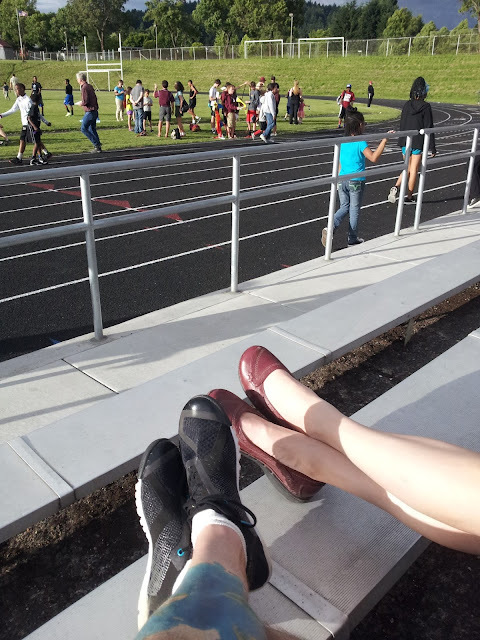 As you would expect at an all-comer track meet, no one was too competitive. There were no fouls in the field events (long jump, 6-pound shot put, softball throw and high jump). The baton hand-off zones were not enforced in the 4x100m relay. I would imagine no one even knew where they were. I would imagine if anyone dropped a baton, they would just pick it up and keep running like nothing ever happened. Finally, this is the only track meet ever where you will see parents holding their children's hand and shouting encouragement as they circle the track in the 400 meters. On the down side, there sure was a lot of crying going on. I'm not sure parents appreciate how far 400 meters really looks to a 6-year-old. More than one tyke just gave up and had to be carried off, face streaming like the Peruvian Amazon. Then there was the 800 meters. That's twice around the track. I'm not sure everyone got the memo. I hope emergency medical was on the scene, some of those kids looked worn out. How about the middle-schooler whose mom joked to him, "Don't let this old guy catch you!" The old guy here is me and I passed him with 100 meters left. He handled it like a man. Maybe next year, son. One fun event that you won't see anywhere else is the predict mile. Before the race everyone writes down their predicted mile time on a slip of paper. Then, everyone (this is an all-ages show) takes off at the same time for four laps around the oval. No watches or other timing equipment is allowed on your person. If you can figure out how to rig a sundial, they might let it slide. The runner who comes closest to predicting his or her actual time wins. How's that for a level playing field? Well, running skill level anyway. Pacing is another skill entirely. The winner was a grade schooler who was within a second. I think the fix was in. A couple high school teams showed up and showed off. Everyone who ran the 100 meters would have been done with the race and a sandwich by the time I finished. The high jump bar was at 6'8" and three guys were still going at it when I went long jumping. For those of you who are curious, I was good for 15'4" there, 40'8" in the shot put and something like 3:00 in the 800. Only the top 8 or so got actual times as they had fewer stop watches than racers. The top 3 got place ribbons, while everyone else got the ole purple 'Effort Ribbon'. 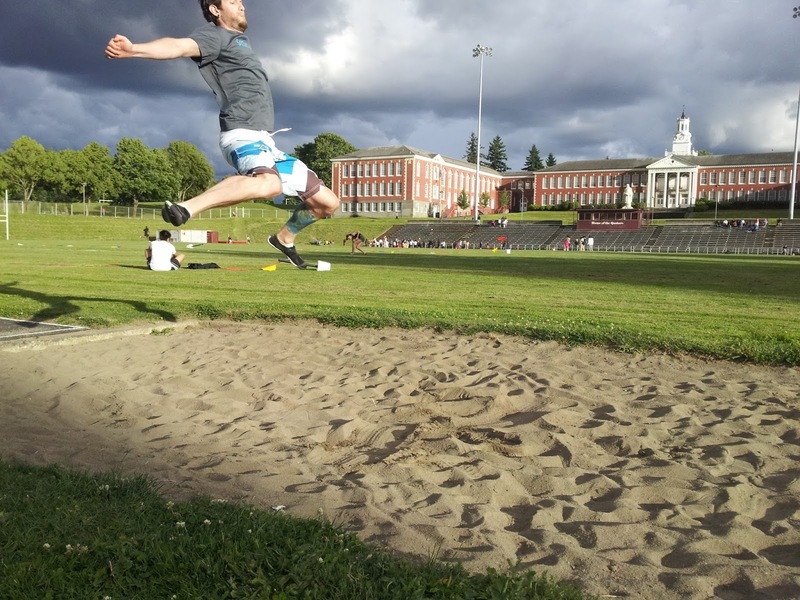 Whether you're reliving the old glory days, showing some young punks you've still got it or toting your young'ns to give them a taste of track and field, Portland's All-Comer Track Meets are hard to beat. They only cost 3 bucks for all the events you can handle and if you save the less-organized field events for last, you could probably run everything. 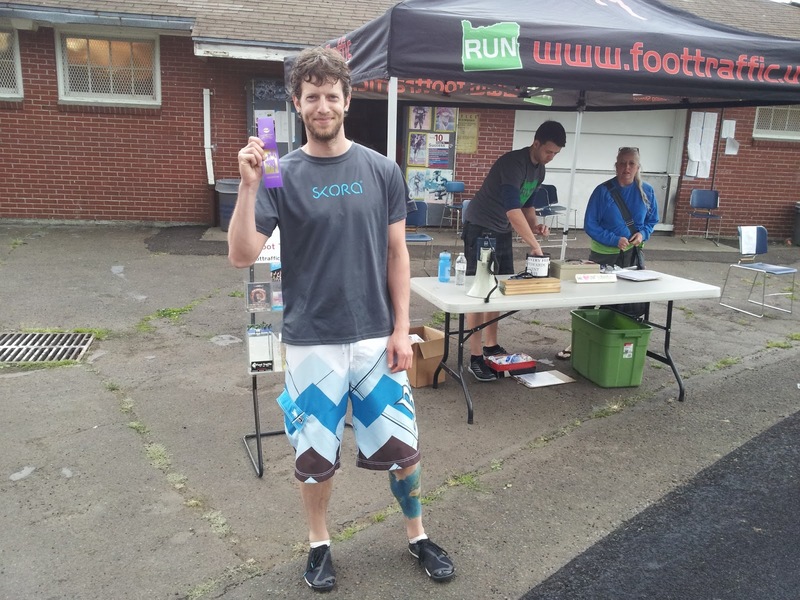 Props go out to SKORA running for the shoes that made me fly, to Foot Traffic for putting the show on and to Dairy Queen for being across the street from the track for celebratory ice cream. If you're down for distance run, check out the All-Comer Cross Country meets starting in September. I'll see you there, and trust me, it's gonna be a huge downer when this old dude passes you. MTB SAN D RIDGE THIS EVENING THO! Not this night, but they have a demo on Sunday I'ma hit up.